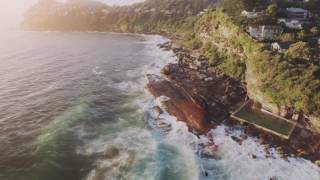 Jonah's Whale Beach is one of Australia's most prestigious ocean retreats located just 50 minutes from Sydney on the Northern Beaches Peninsula, overlooking the Pacific Ocean. Offering the perfect beach-side escape, Jonah's has become a Sydney institution, known for its location, the 180 degree views, luxurious rooms, famous guests and acclaimed restaurant. Jonah's offers eleven luxuriously appointed Ocean Retreat rooms all newly refurbished and elegantly decorated in a natural palette with brass accents and custom designed furniture and cabinetry inspired by a getaway to the Hamptons or the French Riviera. Strategically placed mirrors bring the outdoor surroundings of the stunning coastal location inside. The decor is complete with modern, state of the art features, private balconies and spa baths. A multi award winning restaurant, swimming pool, lush gardens, event spaces and many local activities await. The breathtaking views coupled with award winning, Italian inspired cuisine created by Executive Chef Matteo Zamboni and an internationally recognised wine list curated by Head Sommelier Niels Sluiman make Jonah's Whale Beach the ideal location to enjoy a truly memorable dining experience.